» ‘Sharrows’ on busy highways? Traffic on Lyon Tuesday afternoon. The proposal is to paint sharrows on the street. “Sharrow” sets the spellchecker abuzz because it’s not in most dictionaries. 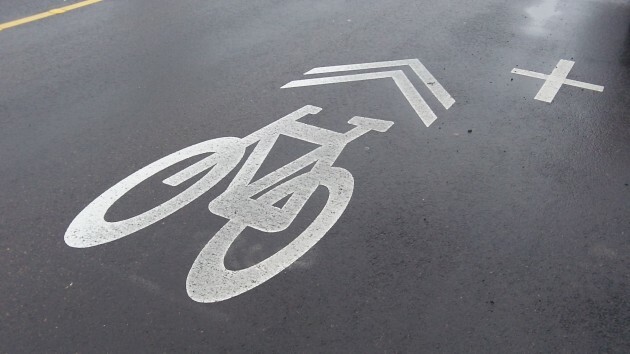 It’s a contraction that describes a pavement marking, kind of an “arrow” or chevron, that calls on motorists to “share” the road with bicyclists. Today’s question is whether sharrows should be painted on Albany’s Ellsworth and Lyon streets and on the Ellsworth Street bridge. What a sharrow looks like. This one is on Main Street north of the roundabout. The streets form the Highway 20 couplet through downtown and together carry plenty of traffic, probably more than 20,000 vehicles a day. 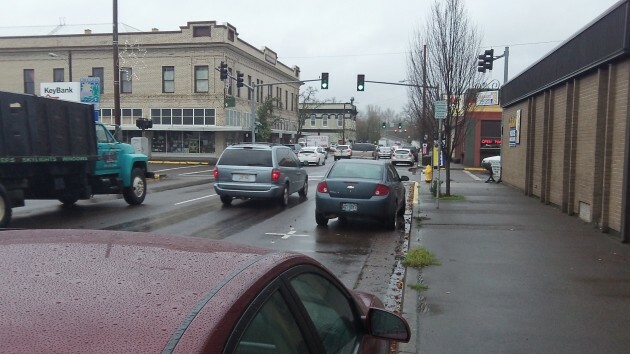 The city’s Bicycle and Pedestrian Advisory Commission says that because of the heavy traffic on these two-lane streets with parking on both sides, Lyon and Ellsworth are a “major obstacle” to bicyclists. To fix this, the commission asked the city council to ask ODOT to allow sharrows to improve safety and accessibility for cyclists traveling between North Albany and parts of the city to the south. On Monday, the council talked about this a little. As a result, the city staff will discuss it with the state highway people in conjunction with a related issue, namely an agreement on proposed alterations in connection with a planned downtown streetscape project. In my view, sharrows may help, but not much. On the Ellsworth bridge, ODOT years ago installed flashing lights to warn drivers when cyclists are on the bridge, and the right lane was made slightly wider than the left to allow vehicles to pass riders with some margin of safety. As someone who rides that bridge from time to time, I’m not sure sharrows would make a difference. As for the streets themselves, I’ve always found it convenient to avoid them because less busy routes on side streets, some with nice bike lanes, exist for just about any possible point to the south, west or east. The trouble with Ellsworth and Lyon is that Albany and the state highway department made a mistake half a century ago in not finding another way to solve what even then was a congested corridor. They built the second bridge at Lyon, condemning downtown to be forever cut in two by a busy state highway. I agree, sharrows do not result in more safety when cyclists and drivers share busy streets. I hardly notice them when traffic is heavy. It would be a waste of money to paint these on Ellsworth and Lyon streets. But the city always seems to have money to waste on non-essential things, so cost will probably not be a consideration. I used to bike the Ellsworth foot traffic portion often. Been decades though. It was a high exhilarating ride. I gladly shared with the rare foot traffic. Then an abrupt approach was put in on the northern end. Now electric wheelchairs (didn’t exist in the 50’s and 60’s) can’t use it unless it has been changed back as original.Yes Jim is correct, paint gets slippery. But that is not necessary. Paint is available that has great friction, just repaint rite over the old when required. And police should ‘police’ motor vehicles getting too close to bike riders anyway.